For a combined celebration of Valentine's Day and the 1-year anniversary of the blog, T chose the highest rated "H" restaurant on Opentable: Hungry Mother. 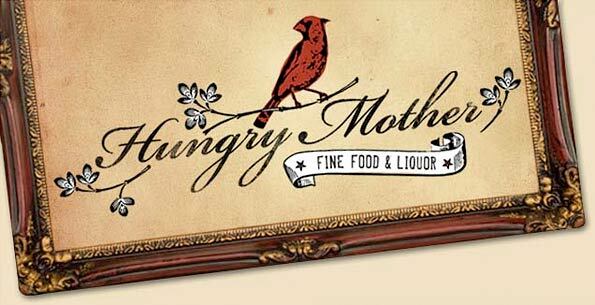 Hungry Mother was opened in 2008 in Cambridge serving Southern-inspired foods to the hungry crowd in Kendall. Chef Barry Maiden, originally from Virgina, has worked in many of the top restaurants in the area, including L'Espalier and Lumiere. To top it off, Barry is currently nominated for the James Beard best chef of the Northeast award! We headed out on a miserably windy & rainy Wednesday evening to our celebration. 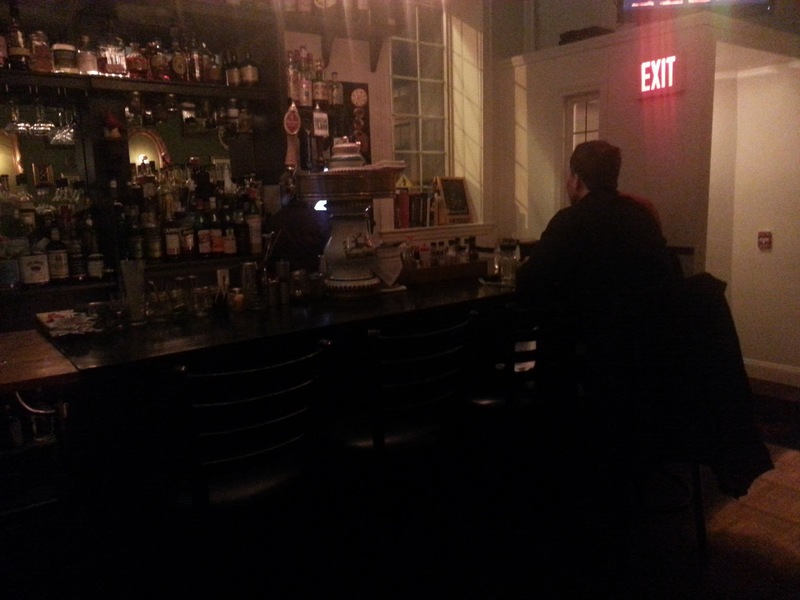 We were swept in with the wind and greeted with a cozy spot & a massive selection of drinks at the bar. 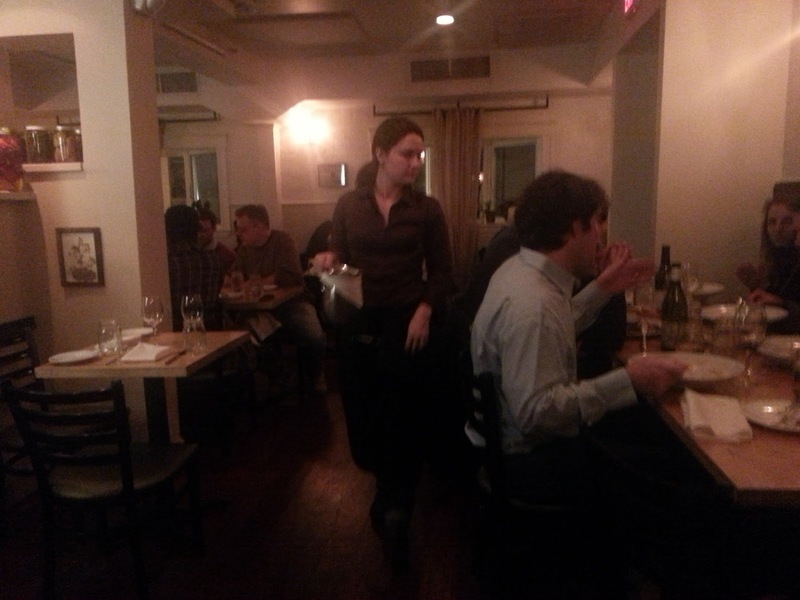 Off we went to our seats in one of the 2 back dining rooms, snuggled into a corner for our private celebration. 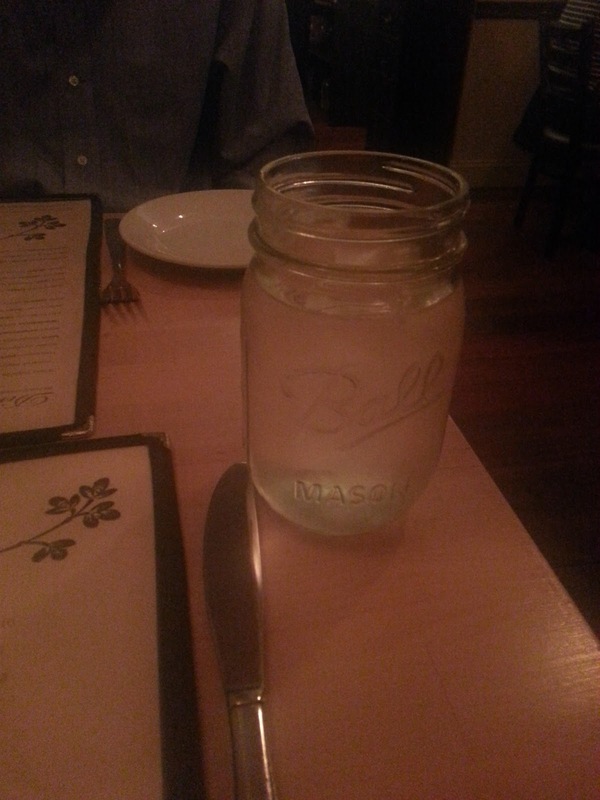 As we scanned the menu, whittling down our choices one-by-one (which was difficult), we sipped water out of ball jars, which just happens to be one of my favorite things. 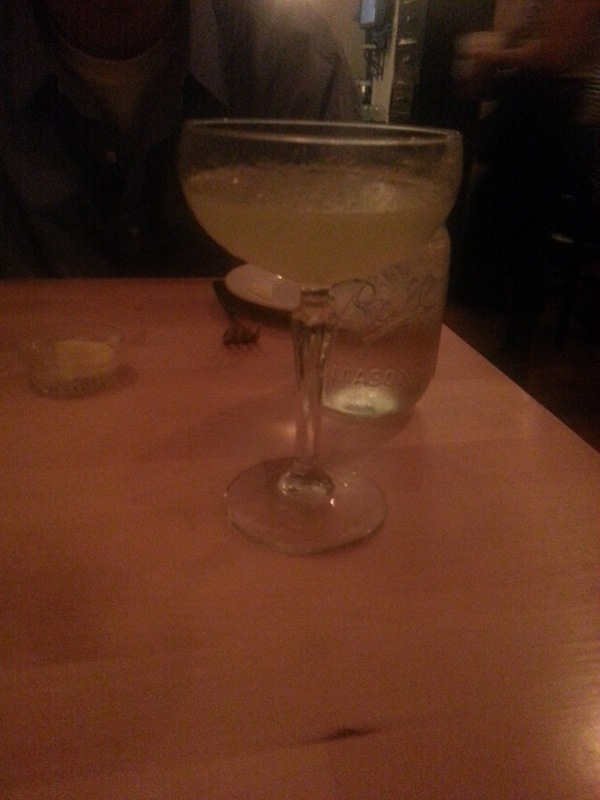 Soon my water was replaced with a Last Word, a combination of equal amounts of gin, green Chartreuse, maraschino liqueur, and freshly pressed lime juice. Tasty, but potent, I'm pretty sure I was well on my way to tipsy after 1/2 of the drink! T on the other hand went with one of my new favorite beers, a Kolsch. 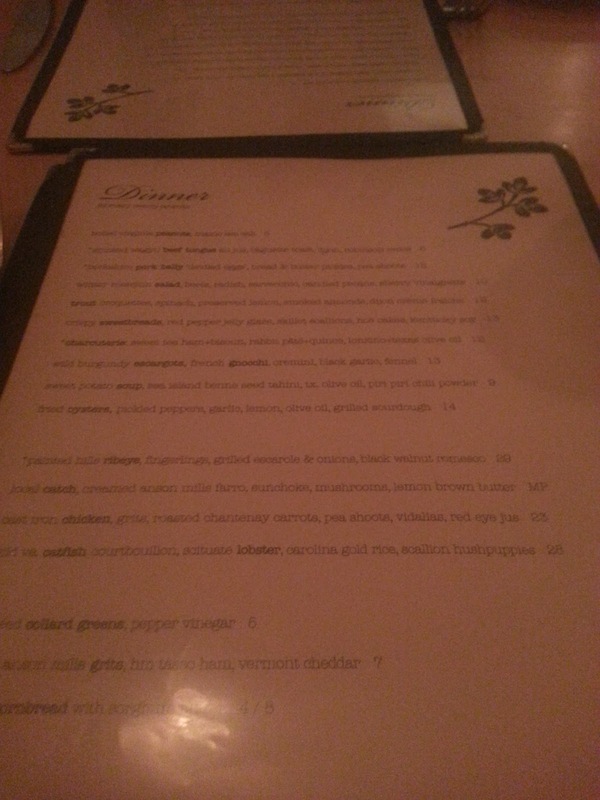 They have a huge list of drinks, especially of note was the lengthy whiskey list. You can find all of their drink options here. 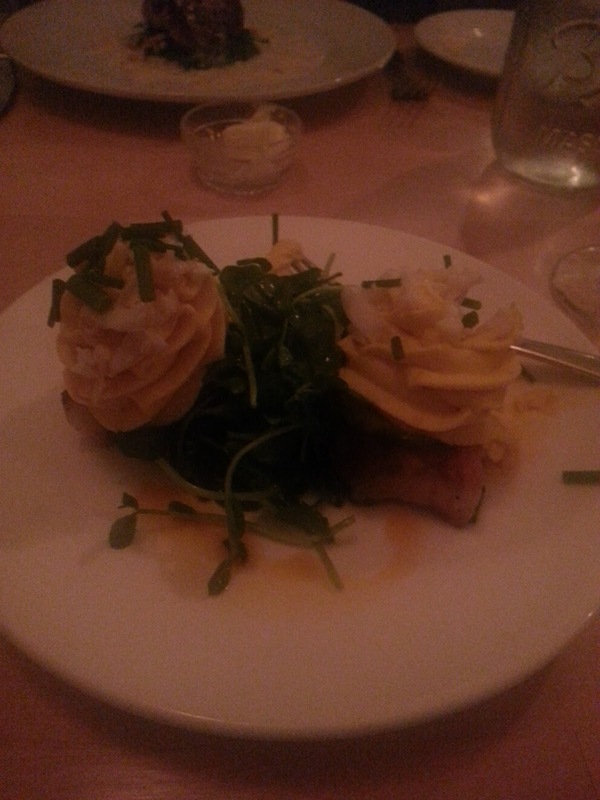 For my first course, I started with the Berkshire pork belly "deviled eggs" with bread & butter pickles and pea shoots. I have to admit I was trick by the apostrophes in this dish. I love deviled eggs so I was dreaming of simple deviled eggs with bits of pork belly flecked in along with a handful of pea shoots to offset the denseness of the yolk mixture. Unfortunately for me, but quite fortunate for lovers of pork belly, the dish was served with 2 large hunks of pork belly, topped with pretty swirls of deviled egg stuffing with chives and served with a side of pea shoots. I enjoyed the combination, but T liked it more. 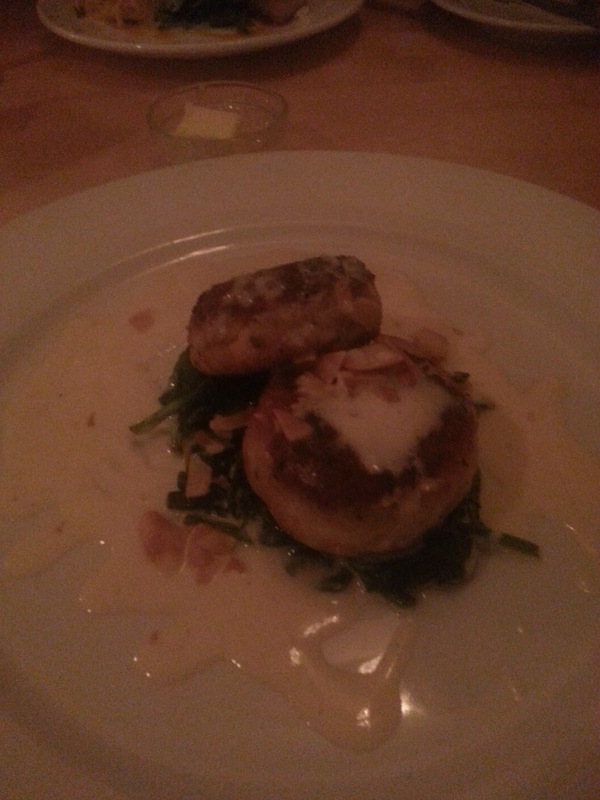 On the other hand, I loved T's appetizer choice, the trout croquettes with spinach, preserved lemon, smoked almonds and a dijon crème fraîche. Perfectly prepared, moist and not dried or flaky, the kick of lemon and smoked almonds elevated this dish to a light and dainty appetizer which was the highlight of my whole night...if only I had ordered it! 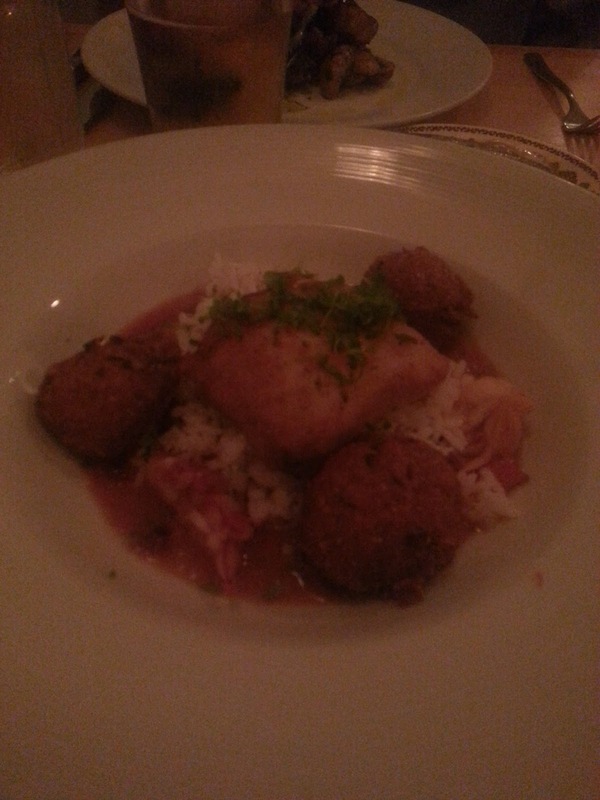 For dinner I went with the wild Virginia catfish courtbouillon with chunks of Scituate lobster, gold rice, and scallion hushpuppies. You better believe I ordered this dish solely for the hushpuppies. Yaaaaa hushpuppies! The catfish was also perfectly prepared, not one bit of flakiness presented itself on this light white fish, coated in the lightly prepared sauce. The rice was there, nothing too special, but it was probably just overshadowed by my 3 balls of deep-fried love....hushpuppies. Obviously I was too full to finish, so T helped me out. He may have enjoyed my dish even more than his appetizer, and stated a combination of all of the components reminded him of a take on a jambalaya. 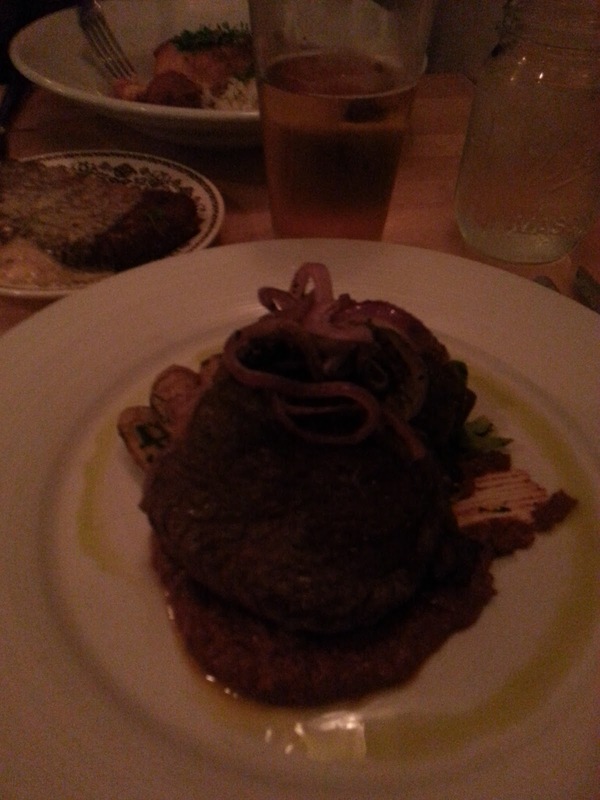 For his entree, T went with the ribeye, served with fingerlings, grilled escarole & onions, with a black walnut romesco. He was not asked how he would like it prepared, and it was delivered prepared medium-rare. I was able to snag a fingerling and could probably survive on those along, nicely crisped on the outside, soft on the inside, and topped with a nice combination of spices while not being overly salted...I was a fan. T spent almost the whole time eating trying to discern the flavors in the romesco (when he wasn't scarfing down the onions). 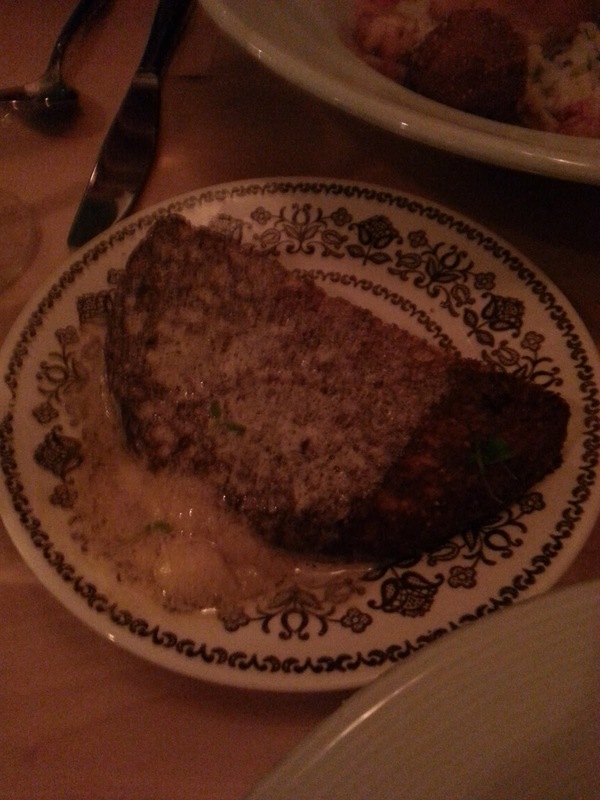 He started out the dish debating if it was a liver-based sauce, and ended the dish being sufficiently confused. There were obviosly no complaints, as the whole dish was finished quickly. We also had to split a small side of the skillet cornbread with sorghum butter. The "small" side dish could easily be split between 2 or 3, or one hungry cornbread-lover. Although not the best picture, this cornbread is my favorite that I've ever found. Deliciously moist, while remaining not too dense and heavy, I could have just ordered the cornbread as my appetizer and been a happy girl. After our meals, we were too stuffed for dessert (even though the special olive oil cake was quietly calling my name) so we relaxed with some mint tea. Also of note, is the bathroom wallpaper. Yes, the wallpaper. 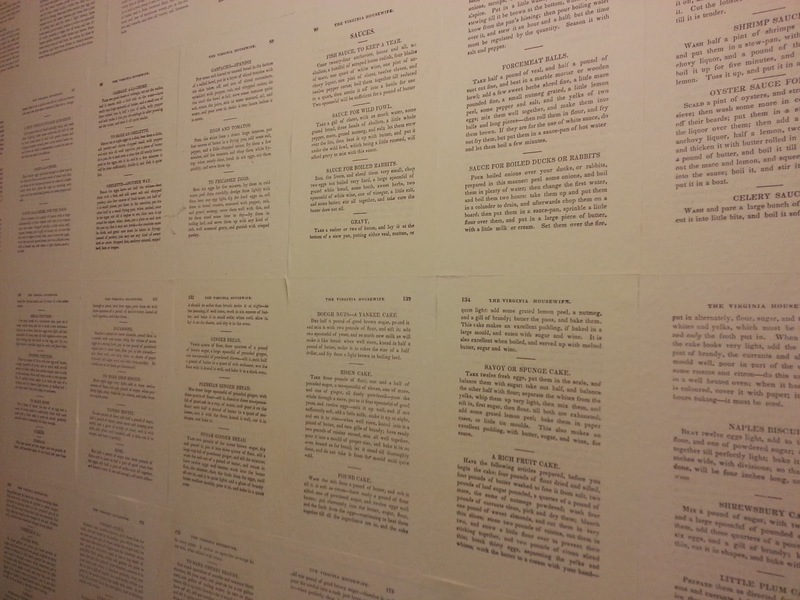 The walls of the bathrooms are plastered with pages upon pages from the Virginia Housewife Cookbook, in order from left to right. While in the bathroom you may enjoy learning how to pickle, preserve, and prepare Southern food. We headed back out into the terrible weather, happy as could be, full but not too weighed down. I'm so glad we were able to find this gem in Kendall, and I can already think of 10+ people I can recommend this spot to off the top of my head. Thinking towards the future, the owners of the Hungry Mother are preparing to open their second venture this year: a Jewish deli located right across the street!